Today's VIS image shows an unnamed crater located in Aonia Terra. Numerous gullies dissect the inner crater rim. 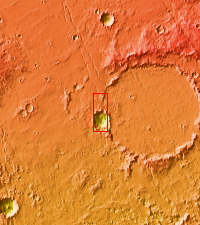 This crater impacted onto the rim of the much larger Slipher Crater.